There is something satisfying about planting flowers, and Gislan does not discriminate when it comes to what kind of flowers are in question. Gislan is the youngest member of a coven of verdant witches. 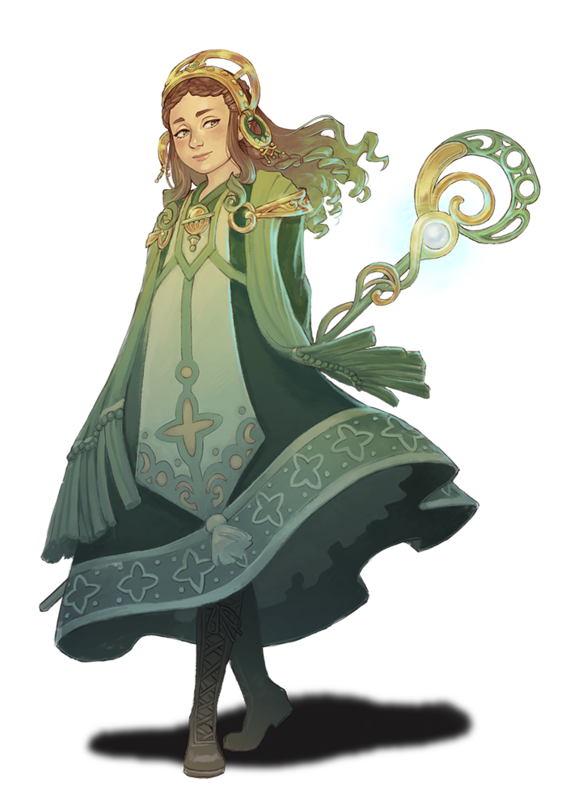 She hails from Alcyon, the sacred island of trees, and was sent to the Astral Academy as part of an exchange program – the witches share their knowledge of the verdant healing arts with one of the wizards in exchange for the wisdom imparted upon Gislan at the Academy. In addition to Gislan, there are still a few more would-be wizards hungry for their Nine Parchments and waiting to be introduced. See them soon! Will we find out a bit more about the characters compared to the trine series in the game, or will it be about the same? You’ll get to hear all these characters talk during their quest for the Nine Parchments, and their dialogue should be a tiny bit more revealing, compared to the Trine characters, Amadeus, Pontius and Zoya. Thank you for your support, we hope the game will live up to your expectations! Great work! Again, I love learning more about the characters, but I am more than happy to see the Trineverse expanding. It reaches a new level of interesting and starts to feel like real place once you add names to locations and descriptions and so on. Nicely done as always, cheers and good luck! Thanks, glad to hear from you, TheraNord! I’ll keep your requests in mind, just in case. For the future. It’s hard to say anything about the trio, feels like they’re in a bit of a limbo right now with our inconclusive Trine 3 🙁 Some day, we’d of course love to go back to the Trine series, but right now it’s full steam ahead with Nine Parchments for us! Glad to see you’re enjoying it, it means the end result will be outstanding. We can’t have the spotlight only on The Three Heroes anyway, it’s a big magical world, there is a place for many heroes big and small. Happy to see you go full speed ahead! Good luck!